The challenge for most parents today is that by grade two, their child has already developed poor eating habits – not only because they crave junk food, but because that’s what they see on TV, in their lunchrooms, at the market and within vending machines. How can a parent fight the trend – supply of cheap, unhealthy food will continue to increase – without constantly badgering their child? It is possible to “retrain their brain” according to Dr. Susan B. Roberts, professor at the Friedman School of Nutrition Science and Policy at Tufts University. “We don’t start out in life loving French fries and hating, for example, whole wheat pasta,” she says. One strategy is to “crowd out” the bad stuff with better food choices, and build associated reward mechanisms and memories so that new neural pathways are created. Here is our list of seven amazing, tasty and colorful brain foods that, when introduced with the right approach, can become regular staples in your home. 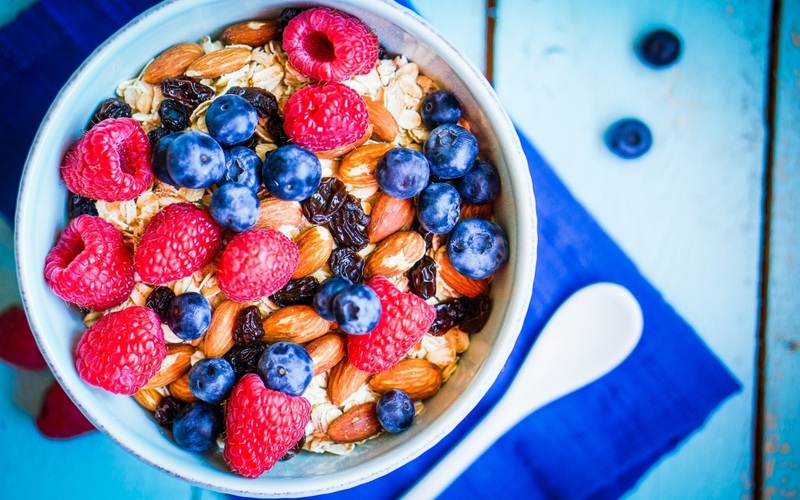 Berries, like blueberries, raspberries and blackberries, are loaded with vitamin C, folic acid and antioxidants that increase mental agility and fight diseases. When it comes to berries, wash them well to remove pesticide residue or try to go organic. Make them memorable by taking your kids berry-picking or growing them in the backyard (most nurseries sell blueberry bushes that can thrive in raised beds with high sun, high soil acidity conditions). Have a bowl of washed berries handy on the kitchen table after school. Nuts, like walnuts, almonds, cashews and pistachios, are all tree nuts that are high in protein as well as Omega 3 fatty acids and Vitamin E – essential compounds for healthy brain function and cell development. Walnuts even look like little brains! As for peanuts, which are in fact legumes that come from the ground, the same benefits are there – protein, antioxidants and nutrients. Nuts are great for snacking on between meals – but make sure to pay attention to food allergy rules at school when sending them in lunch boxes. Fatty Fish, like salmon, mackerel and herring, are also packed with protein and Omega 3 fatty acids. Introduce them in fun ways, such as in tacos and salmon burgers. Try grilling them with your kids, sprinkling on herbs, spices and some olive oil as they sizzle away. Cruciferous Vegetables, like broccoli, spinach, chard and kale, contain loads of phytonutrients and vitamins that support higher brain functions like learning and memory (vitamins K and E provide stimulants to protect neurons that transmit information, while magnesium and potassium maintain electrical conductivity of the brain). Add taste with a pinch of salt and some olive oil. If you are in the United States, you will find fresh, savory varieties of olive oils from local producers in California and Georgia. Wholegrains, like whole wheat, brown rice, oats, quinoa and brown pasta, provide the brain with energy that supports processing, concentration and focus. Choosing whole grains over refined varieties allows the body to absorb their glucose slowly into the bloodstream, eliminating disruptive spikes. Mix in some beans or tomato sauce and you have a complete meal. Eggs are rich in vitamins A, D, and E as well as choline, a B-vitamin that enables your brain to produce neurotransmitters which improve memory and communication, according to research from Boston University. They are also a great source of protein and help your body develop good blood cholesterol (HDL) – despite the “unhealthy cholesterol” myth. A great way to start the day. Tomatoes contain a compound called lycopene, a powerful antioxidant that helps fight brain diseases such as Alzheimer’s. Antioxidants are molecules that block the activity of “free radicals” in our bodies (free radicals are highly reactive atoms that can cause extensive cell damage). When introducing such a profound cultural change in your family’s diet, it is important to employ a delightful, experiential approach. Shop and cook with your kids. Healthy eating cultures, such as those in the Mediterranean or Pacific, embrace local produce and fresh fish from farmers markets – fun places to visit. Cultivate a “joie de vivre” – adding colorful accents such as purple cabbage, red tomatoes and dark green olive oil, and making meals a family event. Choose whole grains, legumes, vegetables and fruits over red meat and sweets. Finally, be patient with it. Do small things consistently. Use larger bowls for salads and smaller plates for meats and starchy food. Drink loads of water. Cheat once in a while with some dark chocolate or carbonated orange juice. Be a role model first, tackling your own demons. Educate your family with documentaries like “Food, Inc.” My daughter and I agreed five years ago that neither of us would drink cola and we never looked back. I don’t even give it a second thought when I am alone on a business trip. Next Saturday, forget your normal routine and take your family to the farmer’s market. Cook up a fresh, wholesome meal at home and savor the day!